Step-1 Please go to Admin Dashboard >> Page. 1. Click on Add New Page. 2. 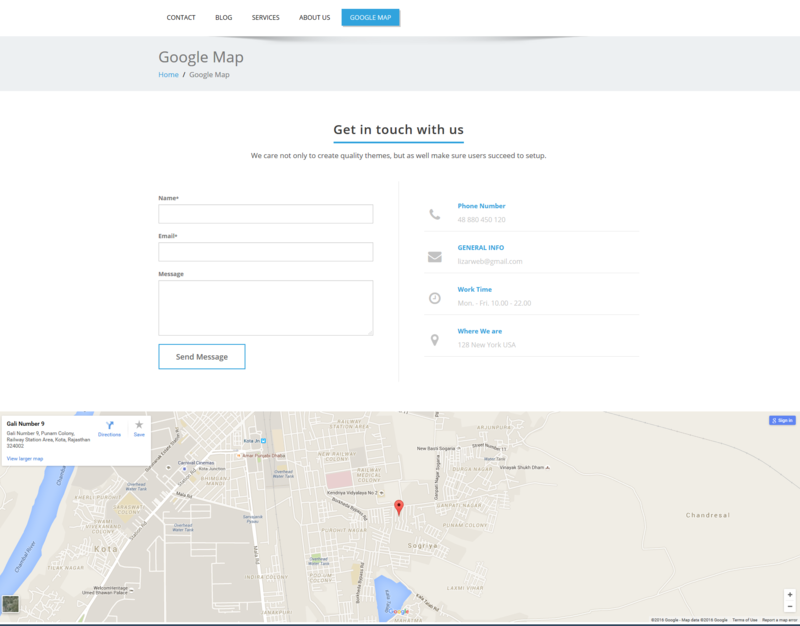 Type Your Page Name, Example- Google Map, contact-us. 3. Add Description whatever you want. 4. See the right sight sidebar page attributes option => template and Select ” Contact-us ” as page Template. 1. Go to Google Search Engine and click on google map. 2. Type Exact Location in google Map search bar for Location URL. Example-: 9-f-17, kota, Rajasthan, india. 3. Go to Menu at TOP Left Corner of your Map Page. 4. Now click on “share or Embed”. 5. Again click on Embed. 6. Now here copy the SRC path of the Map. Step-3 Now go to Admin Dashboard >> Appearance >> Theme Options >> Contact Details. A. Enable Google map in contact section. B. Paste your Google Map URL i.e. copied in Step-3. I share my url map and it does not work.